I realized that Knuckles palettes made Metal Sonic look like garbage, so I thought this would be a cool idea. 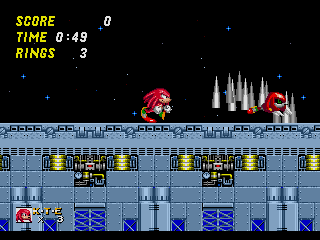 I'm actually considering scrapping this, and just making Knuckles skip the Metal Sonic boss fight entirely. I'm not sure who to credit for the sprites (the Spriters Resource page I got the sprite sheet from says to credit "Master G", but I can't find anything on them, not even in the list of people who worked on The S Factor), and there are several sprites that are missing, that I couldn't hope to recreate myself (like the winning/taunting pose). Any thoughts? 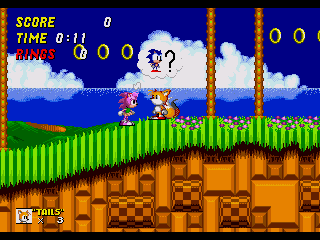 You could perhaps make it a different type of race then, (vertically oriented, more relevant to Knuckles' abilities) that would include climbing/gliding segments? Unless something like that is a bit too much/out-of-scope for the project. ProjectFM and AkumaYin like this. Jdpense, MarkeyJester, VLaD 7890 and 8 others like this. EMK-20218, TheInvisibleSun, Jdpense and 2 others like this. A large number of ASM gimmicks to make S2-SCD mix looks really great and surely deserves SHC18 trophy. Nice work! When I saw how much free VRAM Hill Top Zone had, the first thing that came to mind was "The past needs more dinosaurs"! 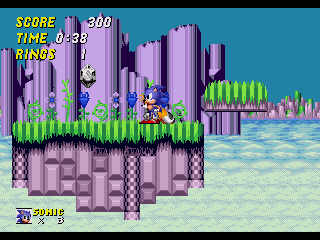 And yes, those Angel Island Zone plants are fully animated. Narcologer, Calvin, KCEXE and 5 others like this. nineko, A-S-H, KCEXE and 4 others like this. Awesome job! I also agree that the time posts would be a good default, being true to CD and all. I love the new time travel option by the way (thanks for adding it! ), although I did imagine it working similar to the rising/lowering platforms in Lava Reef, with the character spin dashing between two spinning "wheels". Perhaps you can add some stars around it to know it's happening? This is looking great sir, keep it up! ProjectFM, MarkeyJester and Pacca like this. ProjectFM, NeoFusionBox, FireRat and 8 others like this. ProjectFM, FохConED, MrLordSith and 6 others like this. Special thanks to Lone Devil for providing Metal Sonics' art and mappings data! A-S-H, Calvin, EMK-20218 and 3 others like this. Mega Team, TheInvisibleSun, Iso Kilo and 7 others like this. Wow, progress looks good as always! 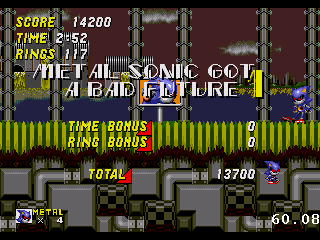 The Metal mode is pretty unique, trying to get the bad futures isn't something I'd expect to have seen but it's actually pretty neat. I like it. Overall I'm liking where this is headed, and I'm enthusiastic to see the next version. Quick edit: Removed a dumb word. 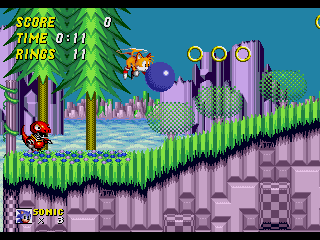 If Sonic 1 zones were to be fully supported, I would change the name back to Sonic CD Remix, as the Unstable Demo was named. As it stands, I'll likely just focus on the Sonic 2 content, and start work on Sonic 1 zones after Sonic 2 has been finished/nearly completed. I was planning to replace them entirely. If you'd like, I could release the prior versions I made myself; they're really nothing special, just some voice edits. @Pacguy I believe the problem is that the new SMPS tracks use pretty crappy instrumentation, and the mixing isn't the best. If IzzyKart is composing these remixes him/herself, perhaps we could team up and have them compose and myself SMPSify? It'd give me something to do (even though I still have to start the Stardust Speedway BF JP port for you. Sorry 'bout the delay...). Also, can I say that the way Metal Sonic plays is really interesting! To be honest, I can't believe it's taken this long for someone to think of reversing the roles, as all the iterations of Metal Sonic that I've seen star him as a good guy (which he really isn't). I can't wait to play your hack once it's finished, the anticipation is killing me lol. @RuthlessTheHooman Looking nice there! It's been cool to see your hack grow since last year, and I hope you continue to grow as a Sonic ROM hacker! Also, I see that Crabmeat in MMZ, nice job working with the PLCs! EMK-20218 and Pacca like this. Hm... From the suggestions I got previously, and my own impressions, the IzzyKart tracks seemed like a direct upgrade to what I had. I was actually thoroughly impressed by how well they mimiced the original songs. But at the end of the day, it's not my opinion that matters. I can introduce you to IzzyKart later to see if their cool with collaborating. @Pacguy the Metal Sonic campaign should have Egg Robo in place of Eggman, imo. And Metal Sonic 3.0 (or otherwise some variation) in place of the Metal Sonic race. 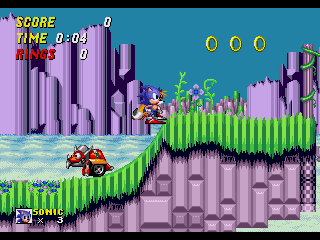 @Pacguy I think that adding the Sonic 1 zones might be a bit much, to be honest. Maybe they could be short 1-act secrets or something?